For more information about this event, please contact Festival Chromatic at sunmin@chromatic.ca. How did the digital arts impact our everyday economy? 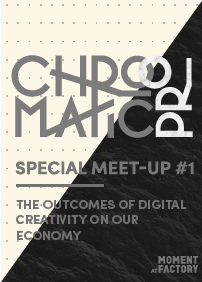 Chromatic Pro will be hosting a rather special meet-up on Saturday January 28th inside Moment Factory’s HQ and you are invited. We can all agree that the digital trend is currently driving everything related to the arts and the culture. It pushes the boundaries and it has never been so stimulating. Start-Ups from all over the globe are hovering over it and seizing the opportunities, but one city definitely stands out. With our artists, studios and we dare say, our creative industry, Montreal is without a single doubt a frontrunner when it comes to digital arts. Just think about all the projects that have come out of this incubator. The purpose and goal throughout the day of this event is to exchange and discuss how the wave of digital affects our economy. Different personalities on the panel will be in charge to conduct this task. What’s the new economy model? How are the artists adjusting to this new form of creation and how are the profits? Those who have become a revelation, how did they do it? Those are some of the questions our panelist will be tackling. ► 10:30am : Montréal, international digital arts frontrunner? ► 12:00pm : The economy in the digital market? Kindly note that all conferences will be held in french. All exclusively english speakers will be indicated.